Embellish your home décor with the graceful, curved lines of this handcrafted, Western style bed. The bed has an arched, framed, padded headboard, and the headboard is adorned with subtle and elegant, hand carved details. 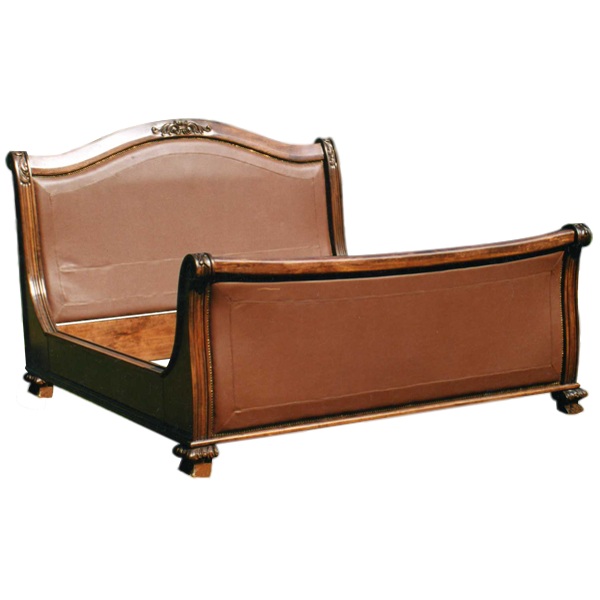 The front of the headboard is upholstered with luxurious, full grain leather, and the front of the curved, framed footboard is covered with matching, full grain leather. The leather is precision hand tacked to the frame with beautiful, gilt nails, and the leather is double stitched together for extra strength and durability. The bed rest on hand carved feet, and it has solid wood, side supports. It has a classic finish, and it is made with the best, sustainable, solid wood available. The bed is 100% customizable.